Solar Proof is the best solar software tool that transformed my business. I've now won 5/7 100kW+ jobs I quoted through Solar Proof and it's only been 2 months! What an invaluable product for any solar business! We use Solar Proof for both small and large jobs - recently our solar business won a 230kW TAFE project using Solar Proof as the basis for the proposal. What a great tool - thanks guys! Solar Proof is an excellent software package I'd highly recommend. We've sold 2 jobs already out of 2 Solar Proof projects! I'm confident we'll continue to get many more sales using this tool. By requesting a demo of this solar software, you agree to Solar Proof's Terms of Service. of solar projects to date! Choose from one of our stylish proposal templates or create your own. System inputs are designed to match the info you collect from your customers. Easily edit each solar quote to tailor to your customer's needs in just a few seconds. Solar Proof's solar software does a complete 25 year analysis by taking 1 full year of hourly energy use data and comparing it to a simulated solar output from the Bureau of Meteorology (BOM). Fill in the details to minimise human-error. Punch out quotes to prospects in a single flash. Get accurate simulation and financial analysis easily. Solar Proof is an easy to use commercial solar software solution. 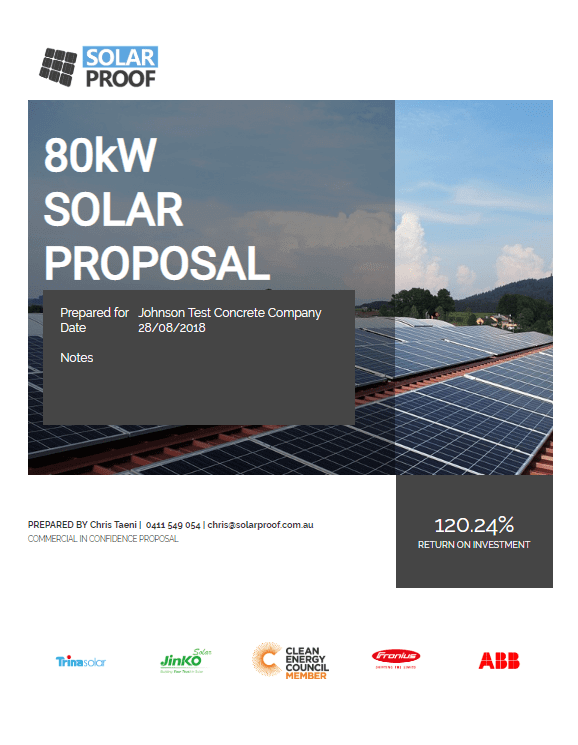 If you have commercial customers (or you'd like to), Solar Proof takes a lot of the work out of preparing proposals. You can present professional proposals to potential commercial solar customers withing minutes. If you have used any other software or even spreadsheets to prepare commercial solar proposals in the past, you will save a LOT of time using Solar Proof! We have the all-in-one commercial solar software solution your business needs to help it truly thrive in today's solar industry. While Solar Proof is essential as a commercial solar software package, it can easily handle residential customers as well. We are committed to making the most useful solar software on the market. So if you need a residential solar software solution AND something that handles commercial, Solar Proof is what you need. Creating an accurate solar battery analysis is easy in Solar Proof. You can add batteries to a solar project and show your customer exactly what they can expect. You can even run comparisons between battery and non-battery solar solutions for your customers. Solar Proof is a proposal-centered software package. In fact the proposal takes center-stage on the screen and is entirely customisable to suit your precise needs. Whatever you can imagine presenting to your solar customer, you can create with Solar Proof's solar proposal software. Solar Proof will do an hourly analysis of the customer data (as mentioned above) and compare this across a full year of solar data! Solar Proof is the best solar business software on the market to perform fast, accurate analyses using interval data. Solar Proof uses minute-data from BOM (converted to hourly intervals) to get the most accurate solar data available in Australia. This is ground-station data which cannot be compared in accuracy with satellite data. When you enter a site into Solar Proof it will auto-find the closest solar data available. If more than one dataset is available, you will have the option to select a particular year (should you wish to do so). Your prospects trust you more when you present using third-party tools like ours! Sell any type of solar system easily! Get the exact template you want to communicate to your customers just right.